Tucked away along a protected bay on the west side of San Juan Island this former British military camp is one of the Islands most beautiful parks. Immerse yourself in colonial history as you explore the vast trails and grounds. What can I see and do at English Camp? The British knew how to choose a fantastic spot for a garden and settlement. Wander along the calm seashell strewn bay and ask yourself whether they could have chosen better. Hike up Mt. Young and look across the sound all the way to Victoria. Discover the remaining artifacts of British occupation. See the formal British garden and historic buildings. Enjoy a golden picnic, at sunset. 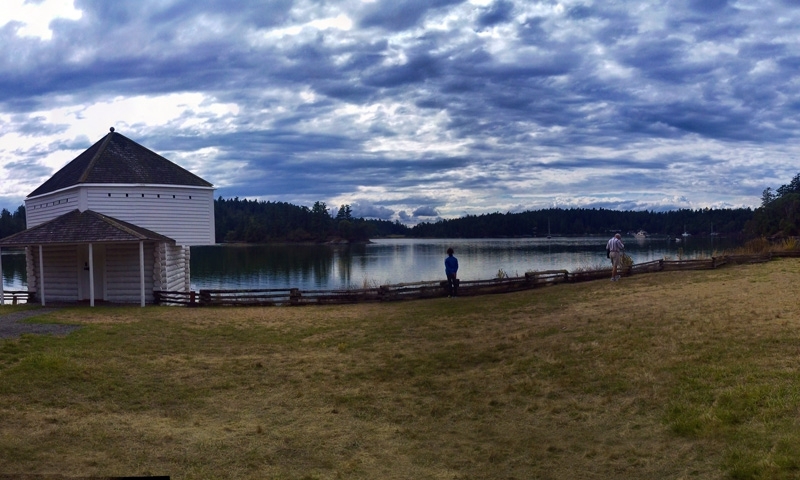 English Camp is on the northwest side of San Juan Island, nestled along Garrison Bay. From downtown Friday Harbor head out of town on Roche Harbor Road and take a left on West Valley Road, then just watch for signs. When is English Camp open? The Camp is day-use only, so it’s open from dawn to dusk all year long. The Visitor Center is open 9:00-5:00, June through September. While the Visitor Center is open Park Staff will be more then happy to answer any questions you might have. They can also take reservations for large groups or schedule informative tours. 360-378-2240.